Astronomy Science ~ What causes red spots on the surface of Jupiter has puzzled astronomers for years. Now they may have the answer, "SUNBURN" A new analysis of data from Cassini show that the reddish color on Jupiter's Great Red Spot is probably the result of a simple chemical substance that is broken apart by the sun in the Jupiter atmosphere. These results conflict with other leading theory said that the origin of this striking color redness caused by chemicals that come from below Jupiter's clouds. 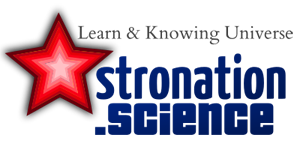 The results were presented by Kevin Baines, a Cassini team scientist based at NASA's Jet Propulsion Laboratory (JPL), at a meeting of the American Astronomical Society's Division for Planetary Science in Tucson, Arizona. Baines and his colleagues at JPL Bob Carlson and Tom Momary arrived at this conclusion when they use a combination of data from Cassini in December 2000 while flying passing Jupiter and laboratory experiments. In the laboratory, the researchers destroyed the ammonia and acetylene gas - chemicals that are known on Jupiter - with ultraviolet light, to mimic the effects of the sun on these materials at extreme altitude clouds in the Great Red Spot. This experiment produces a reddish material, which is compared to the Great Red Spot when observed by Cassini instruments Visible and Infrared Mapping Spectrometer (VIMS). 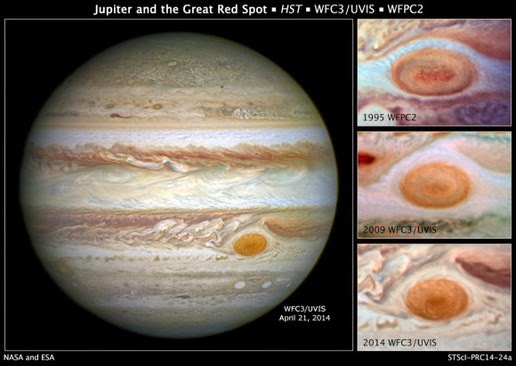 They found that the light scattering properties of red herb they match the model of the Great Red Spot is red where the material is confined to the height of the top features similar storm in Jupiter. Our model shows most of the Great Red Spot is actually quite bland in color, below the upper cloud layer reddish material ", said Baines. Under this reddish color there may be a cloud of whitish or grayish", he added. A limited color at the top of the cloud would be inconsistent with the competing theories, stating that the red color is caused by chemicals that rose up and formed deep beneath the visible cloud layer, he said. If the red material is being transported from the bottom, it should be present in other heights as well, which will make reddish elsewhere. Great Red Spot is a feature of long-lived in the atmosphere of Jupiter that has a diameter of 2 times the width of Earth. Jupiter has three main cloud layer, which occupies a certain height in the atmosphere; from highest to lowest inhabited by clouds of ammonia, ammonium hydrosulfide and water. As for why the red color looks very bright in reat Red Spot and some much smaller places on the planet, caused by the altitude factor. "Great Red Spot is very high. Reaching altitudes much higher than elsewhere in the clouds of Jupiter," said Baines.